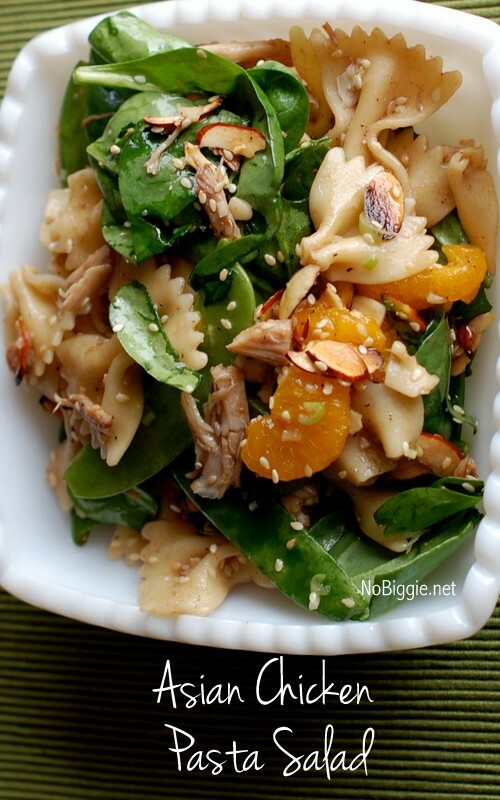 Asian Chicken Pasta Salad…this salad is SO GOOD! This might be (in my opinion) the best salad recipe I know, it’s a meal in itself. It’s the kind of salad that you’d serve at a baby shower or a bridal shower, and everyone will be asking for the recipe. It’s a family favorite. Doesn’t it look so good?! We made a quick video to show you how easily this salad comes together! We make two batches of the dressing, one for marinating the chicken and pasta in overnight, and a second batch for tossing the salad with right before serving. Toast the sliced almonds and the sesame seeds (separately) in a dry hot pan. Here are all the ingredients minus the dressing and the marinated pasta and the chicken in a big bowl ready to be tossed with the chicken, pasta, and dressing. And here it is all tossed together! Oh, it’s so good. I hope you love it as much as we do! This salad is the perfect salad to serve at your next big family gathering, a baby shower...a bridal shower...even a regular Thursday...it's so good! Toast the sesame seeds in a dry pan, remove from heat and separate into two bowls for the dressings. Shred the chicken breast meat from a rotisserie chicken. Mix up the two separate batches of the dressing to be used as a marinade and later as a salad dressing. Cook the pasta until al dente (do not over cook the pasta), remove the pasta from the water. In a large bowl while the pasta and chicken are still warm, add the dressing and toss. Cover the bowl with plastic wrap and chill in the refrigerator until chilled. Optional: If you'd like, you can move the chicken and pasta to a ziplock gallon sized bag to chill in the fridge for a more even marinade. Marinate chicken & pasta in the fridge overnight, or for a few hours until chilled. Toast the sliced almonds in a dry pan, remove from pan. In a large bowl add the marinaded pasta and chicken and all the other salad ingredients. Toss with the salad dressing and serve. * It's important to under cook the pasta. It will continue to cook a little more in the marinade. 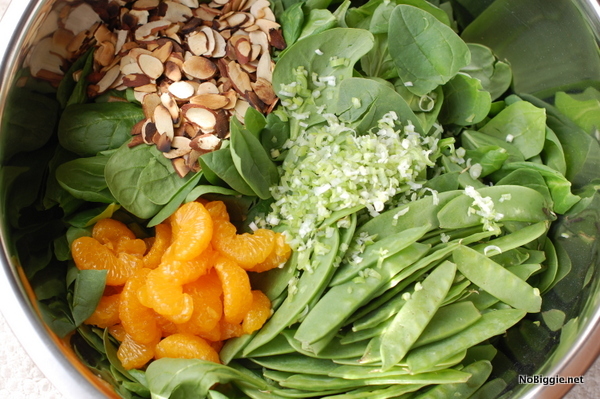 The spinach will start to wilt once the salad is mixed with the dressing, so you can add the spinach in small batches if serving this salad for a shower or party that is an open house style. Okay, it's 1:30am in the morning but I'm craving Asian chicken salad. This looks so good! I definitely need to make it! I would say about 2 cups of shredded cooked chicken and yes! …the pasta is cooked before it is marinated. Thanks! It’s a great recipe! Rats, now I have to go to the store. funny that Shauna likes it with lots of pasta and I like it with lots of spinache! This looks really, really yummy. I haven't had breakfast yet, but I want this already. I love asian salads, so I'm printing this out and making it tonight! That looks REALLY good. I am gonna have to give it a go! I love that recipe. It's so yummy!! I use sesame oil in mine. Have you ever tried that? It gives it a really good flavor. I love all the recipes. I've never thought of using a rotissere chicken like that. I'm going to have to try it. Does the chicken dry out in the fridge?? I was wondering if you did less or half and half when you use the sesame oil (in place of vegetable oil)….I LOVE the smell and flavor of sesame! I always add sesame oil too. Kam you are sharing our family's secret recipe. It is sooo good! Looks yummy. I make a salad like that with a Teriyaki dressing and peanuts added. I'm going to have to make both versions I can tell. looks so yummy and fresh. I have enjoyed all your rotissere chicken recipes. I love how you can just get them at the store all finished and no roasting the chicken is needed. You can have a fresh gourmet meal fast. 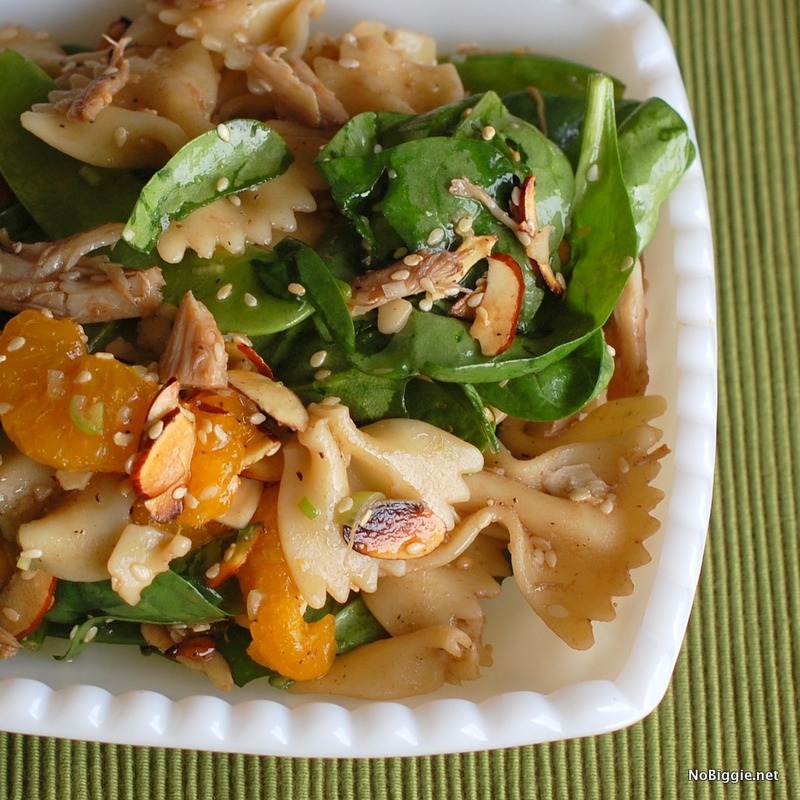 There are so many variations of this recipe, but this is the first time I've seen it with bow tie pasta and spinach. 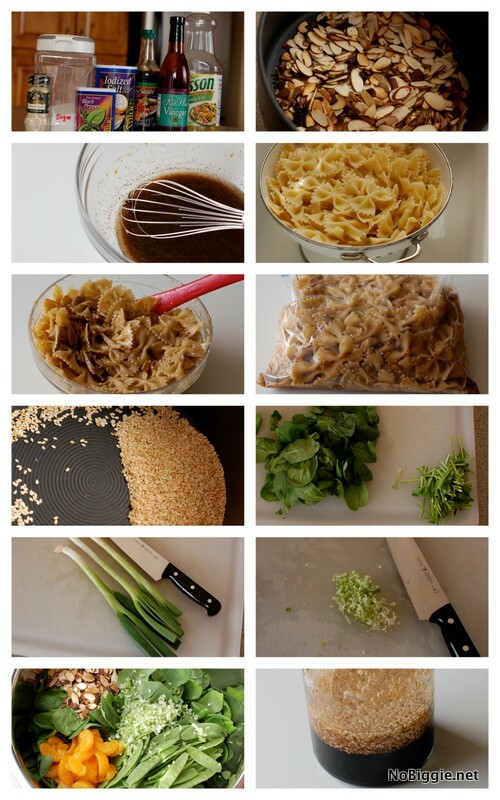 I've seen the recipe with Ramen Noodles and Napa Cabbage. I also love the Mandarin Oranges in it. I'm going to try this. Thanks so much for sharing it. MMMMMMMMMMMM, I'm totally trying that one! It looks delish! yippee! a recipe i can make tonight- i have all of those ingredients at home! Can't wait to get to the store so I can make this. Thanks! That looks so tasty! I will definitely have to try that one out. Ha- I do the same "chop it into oblivion" thing with tomatoes when I make salsa. They are necessary for the flavor, but I don't like biting them. I had this salad at a baby shower and yes, I have really been wanting the recipe. Thanks! My mouth is watering now! That salad looks soooo good. Once again I'm loving your pictures of food. You should work for a food magazine. Mmm… I'm for sure going to make that and try to impress people. My question is, do you need to undercook the pasta since it marinates overnight? I didn't know if it got mushy or anything. Amanda & Shauna – I too usually use Sesame Seed Oil, not sure why I forgot that part. It really is so good in this recipe. I will edit now. Shaunee – Yes, good point. It's a good idea to under cook the pasta a bit. Al Dente is ideal. This looks so good! It just may be Sunday dinner. I have a similar recipe but I have to say this looks better. I think I'm throwing out the old one and adding this one to my file. Seriously loving this series. Did I mention I buy a chicken every week? Thanks! I made this last night – It was SO tasty! I didn't wait to marinate overnight, it might have had more flavour though, but it was still yummy, I also added some sesame oil and julienned the sugar peas. Oh and I used rice vinegar because that's what I had on hand. Thanks for sharing! Oh, Kami! You're making me want to start cooking again! These are so super yummy. I'm loving chicken week! i've made this recipe before and it is so yum! i made this tonight, and it was delicious! i'm linking to this post on my blog. thanks for sharing! Making this without the chicken (since I'm doing the vegetarian thing). Looks delicious and know my kids would love it! yum!i love this type of salad. This looks absolutely delicious! I have a family gathering tomorrow that is pot-luck style, so I'm going to make this. Thanks for the recipe! I can't wait to try it! This recipe was WONDERFUL, my kids (2 and 4) loved it too! I love the dressing/marinade, I think it would be great on pork chops or chicken grilled. Thank you for sharing! I will be making this again soon. This looks delicious! I'm bookmarking this one. Yum! I just made this tonight and it was delicious! It’s funny, I bought the green onions but I forgot to add them. The salad still tasted great 🙂 Thanks for sharing! I made this tonight…….so good! My family loved it. I decided to salt and sugar the almost and they were GOOD! Thanks for sharing this recipe! I needed a good Asian Salad in the mix! A big group! Depending on portion size, it’s great for a party or shower. I want you to know that this was my FAVORITE salad of 2010 ( I even commented up there)! I made it all the time, and my family loved it, too. And then sometime the next year I somehow forgot about it, and lost the recipe. I got hungry for a salad today, and remembered how good this one is…and have been furiously searching post after post for the last half hour, trying to find this one. 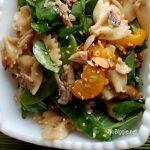 You have no idea how many Asian chicken pasta salads come close, but not close enough (or how many variations a search engine can bring up of that name and/or the ingredients…there weren’t that many back in 2010). This looks really good! Should I double the recipe for the dressing or split in half for the overnight marinade and the dressing? I’m confused by your question. I double the recipe for just the dressing. one batch to marinate the chicken and pasta in the fridge overnight and the second batch is for everything else right before you toss and serve. Kami, that answer helps. I will half the recipe for just me. I’m looking forward to it for my lunch at work this week. Hi Dina! It would be better to marinate Saturday Morning for a few hours rather than a day and a half. If you marinade too long, you risk making the chicken tough. I have had this pinned forever and just made it tonight the whole family loved it. I didn’t realize you needed to marinate the chicken & pasta overnight which I am sure would make this even more delicious. However we made it with a rotisserie chicken and just tossed everything in a bowl with the dressing. It was awesome & I am sure will become a staple in our weekly menus. Thanks for sharing! Would like to know the size bag of sliced almonds, peas and the size can of mandarin oranges. Can guess, but would like your exact recipe. Pasta and chicken marinating now! Thanks…….